Zoe Polk has been hanging out at Pedestrian Shops since she could walk! 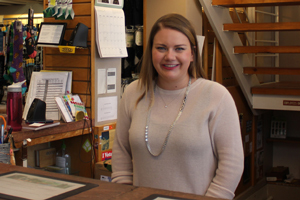 Born and raised in Boulder, she came back to work full time at her dad's shop after college and now plays a key part in running the family business. Perfect Summer Saturdays in Boulder always start with a trip to the Boulder County Farmers Market. I love picking up fresh produce, treats, and cut flowers. Sometimes I'll get a breakfast at the market, or if I'm feeling fancy I will get a table at the Dushanbe Teahouse for brunch. The Chai Pancakes are great! After that, nothing is better than a stroll up the mall on a nice day! I'm likely to stop and watch a guitar player or the famous zip code man. Some of my favorite shops to browse are on the West End, like Alpine Modern, Cedar and Hyde and Two Hands Paperie. Perfect days always include a cocktail on a patio somewhere... the back patio of the St. Julien has a really fantastic view! Eventually it will be time for a bite to eat. The restaurants can be busy on beautiful days but if you are willing to sit at the bar you can typically get in anywhere! The Med has been a long time favorite of mine, I'm a sucker for bacon wrapped dates and the med sampler. Because it has always felt like home. Alpine Modern Shop is a meticulously curated design shop located in the newly developed PearlWest building (1048 Pearl Street). Indulge in a complete meal with friends and family, work on your laptop using our ultra-fast internet, or grab a quick espresso in the heart of downtown.